Mikrotik 4 WAN Load Balancing using PCC with PPPoE Server / Complete Script ! – Penyedia Layanan Internet Dengan Paket Termurah, IT Expert, Server Pulsa, Domain & Hosting Solution paling Profesional di Kota Bantul Yogyakarta Indonesia. Mikrotik 4 WAN Load Balancing using PCC with PPPoE Server / Complete Script ! Penyedia Layanan Internet Dengan Paket Termurah, IT Expert, Server Pulsa, Domain & Hosting Solution paling Profesional di Kota Bantul Yogyakarta Indonesia.-Mikrotik 4 WAN Load Balancing using PCC with PPPoE Server / Complete Script ! Following is a complete script for Mikrotik to combine/load balance 4 DSL lines. This server is also acting as a PPPoE Server, therefore I have made some modifications in PCC Script. 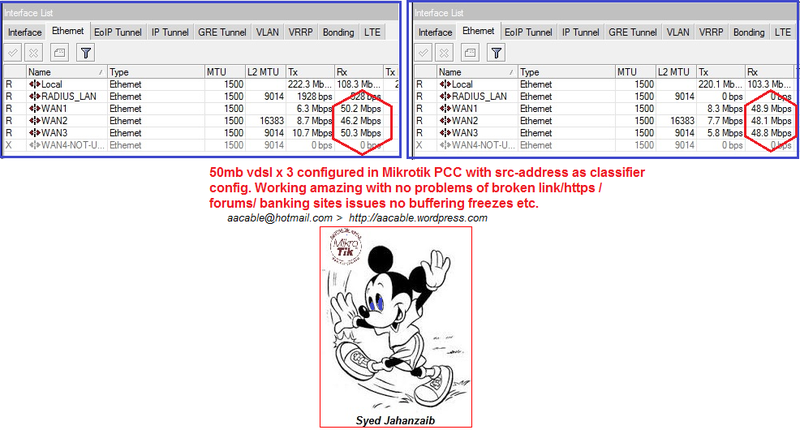 In this example I used MikrotikT RB750 5 ports router. 4 ports were connected with four DSL Routers, and 5th port was connected with User LAN. Also don’t forget to rename the interface names accordingly. This script will also add pppoe server , one pppoe user, dhcp server, dns server and pcc. In my personnel experience , If users request are directly hitting Mikrotik configured with PCC , then you will get good load balancing. Use src-address as classifier, this way you will get rid of problems like https/broken link, streaming issues etc. 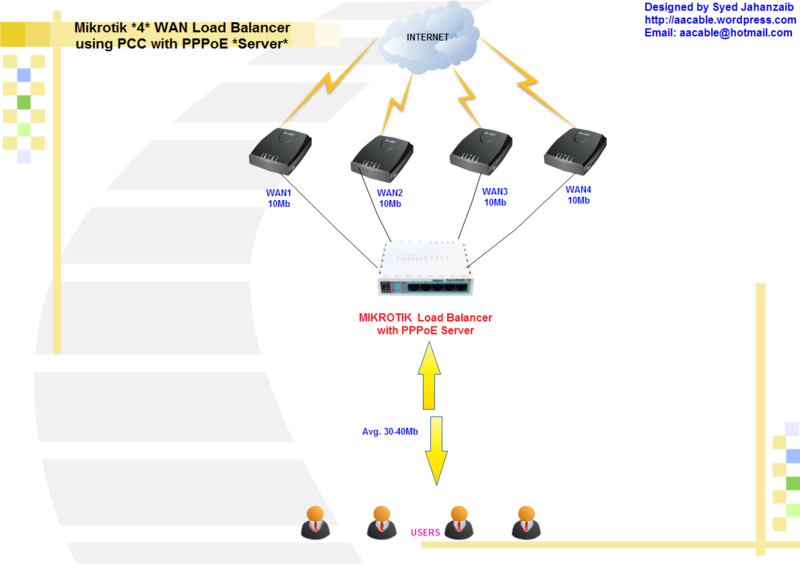 Load balancing using this PCC technique (src-address) will be effective and balanced approach when more and more connections (from clients) that occurred. I also recommend to use SQUID proxy server along with mikrotik , either parallel or in front or backend , for better response time and it will also increase good browsing experience to users. If somehow you are not satisfied with the src-address approach,play with the PCC-Classifier, Try both addresses and ports as the classifier. While this will randomize things the most and in theory give you the most fair allocation of bandwidth, BUT there is also a good chance that it will break certain things like banking web sites and some forums. This is because often times a HTTP requests will generate several connections, so there is a chance that some requests may go out a different route than the initial one, and that will break secure web sites. For that reason I usually stick with src-address for PCC load balancing. /ip dhcp-server add address-pool=dhcp_pool1 authoritative=after-2sec-delay bootp-support=static disabled=no interface=Local lease-time=12h name="My DHCP Server"
If you wanna run PCC with HOTSPOT on same Mikrotik Server, Put this rule in place to stop the hotspot from processing people after they have signed into the network.